Introduction: Several reports have demonstrated the surgical treatment strategy for patients with dialysis-associated spondylosis in the cervical spine (CDAS) with destructive spondyloarthropathy (DSA). However, studies focusing on the clinical outcome of patients with CDAS without DSA remain scarce. We aimed to review the treatment strategy of patients with CDAS but without DSA. Methods: The clinical data and surgical records of consecutive patients with CDAS without DSA (n = 9; D-group) and cervical spondylotic myelopathy (CSM) (n = 30; C-group) who underwent modified double-door laminoplasty (DDL) were reviewed retrospectively. We investigated four radiologic factors in the pre-and postoperative periods that have been reported to be the risk factors for worsening of clinical symptoms in various studies and examined statistical comparison between the D and C groups. 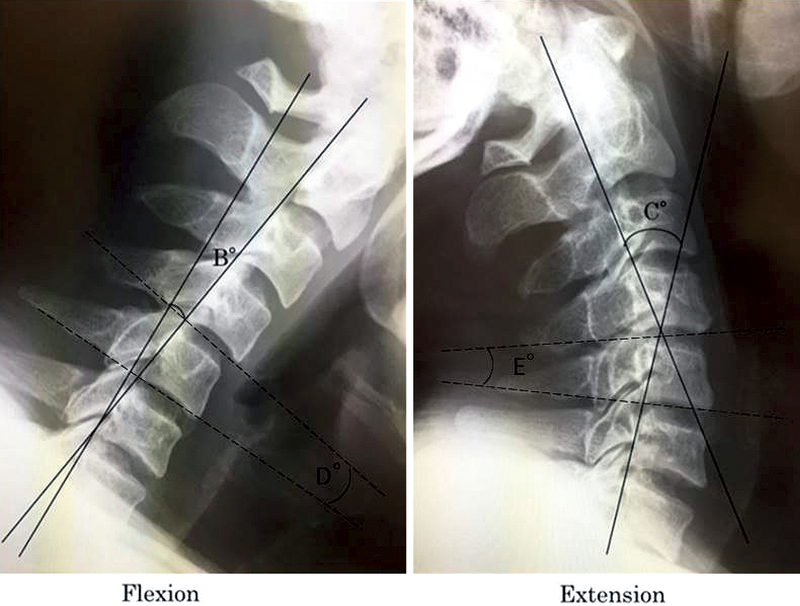 Results: In the D group, the pre- versus postoperative C2-C7 sagittal angles were not significantly different, and only two patients (22%) had kyphosis postoperatively. There was a significant difference in the pre- and postoperative C2-C7 angles in the two groups (P = 0.031). Regarding the change in segmental alignment, the local open angle increased at the C4/C5 level in the D group. Also there was a significant difference in the local angles between the two groups at C4/5 and C5/6 (P = 0.00038, and 0.037), suggesting that postoperative segmental mobility at C4/5 and C5/6 was higher in the D group than in the C group. Conclusions: In the present study, DDL in patients with CDAS without DSA did not adversely affect the postoperative alignment and stability compared with CSM patients with CSM. However, patients in the D group may have a chance to develop DSA change at the C4/5 level in the future, and careful long-term follow-up is warranted. © 2018 The Japanese Society for Spine Surgery and Related Research. CC BY-NC-ND 4.0 (https://creativecommons.org/licenses/by-nc-nd/4.0/).